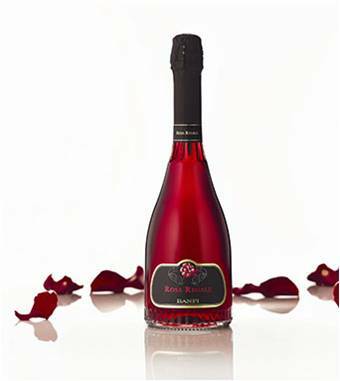 My favorite wine for “romance” is Brachetto d’Acqui…use any brand you like but the absolute romantic-est is Rosa Regale by Banfi Vintners. Just look at it…the bottle is elegantly shaped, the clear glass means you can see the beautiful clear garnet-red color of the wine, and as if that weren’t enough to make it just sing “Valentine!” the black and gold label has a picture of a red rose! This is the everybody loves it wine of your dreams. From Piedmont, Italy and grown in the company of some mighty heavy hitters, Brachetto is the wine to bring on a date. Trust me on this one. This wine has all the ingredients you need in a romantic wine …it’s pinkish-red, bubbly, lightly sweet, a perfect match for chocolate and low in alcohol. Wink, wink, that low in alcohol bit will come in handy in case the date is a success. As if that weren’t enough, the slight sweetness in this wine and the raspberry-strawberry flavors make it a perfect match for milk-chocolate dipped strawberries…imagine the possibilities. The aromas of this wine are easily recognizable and always consistent: The first to hit are raspberry and strawberry, followed immediately (sniff above the rim of the glass) by a strong scent of rose perfume. I have been known to describe this aroma as a haunting memory of roses, rose-honey potpourri, or wedding bouquet. After you demonstrate the roses in the wine aromas, the rest is up to you!